It is easy to be overwhelmed by the bevvy of cookware options available today. It seems like everyday new features and materials are being added to pots and pans. Multiclad cookware is a good example. Understanding the pros and cons of this variety of cookware can help you decide if it is right for you kitchen. Multiclad cookware is constructed from layers of different metals. Most commonly this includes an aluminum core surrounded by stainless steel. The inner metal provides superior heat conduction while the outer metal is selected for qualities like stick resistance and dishwasher safety. This combination of metals makes for fast and convenient cooking. The heat conducting core helps food cook quickly and evenly while the outer metal facilitates easy cleanup. The best multiclad cookware contains an inner core that extends up the sides of the pan. This ensures the sides of a pan are just as hot as the bottom is. Some less expensive pans are called "multiclad" but their heat conducting core is limited to the bottom of the pan. This can result in uneven cooking. Multiclad cookware is great for discerning home chefs. Most multiclad cookware lines can go straight from the stove to the oven to the dishwasher. However, the food preparation benefits will probably only be noticed by someone who cooks frequently and appreciates subtleties in food quality. It is a great gift for a newly married couple but probably a bit pricey for a teenager's dorm room. 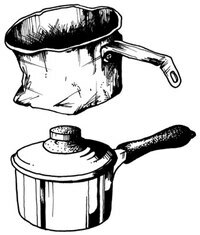 Todays Modern Woman: What is the Difference Between Multiclad and Normal Stainless Cookware? This article lets readers know what essential kitchen tools they should possess for everyday cooking and baking.